Owners of the wood chip carrier M/V New Carissa, which grounded on the Oregon coast in 1999, have agreed to pay the Oregon Division of State Lands US$25M to cover the cost of removing portions of the ship that still remain on the beach. The Oregon Dept. of Justice has said it will place the money into a special account pending results of an appeal filed by vessel owners in late Dec. 2002. If the appeal is unsuccessful, the money will go toward salvaging the ship's surviving stern section and the bottom of the cargo hold. In a thunderous blaze, demolitions experts ignited a series of explosives 11 Feb. and set a grounded cargo ship on fire to save Oregon's beaches from a disastrous spill of fuel oil. Bright orange flames jumped hundreds of feet from the middle of the 639-foot M/V New Carissa, and were followed by a smudgy black plume of smoke that drifted up the coastline. ***New Carissa Owners Blame Coast Guard ........ as owners of the freighter M/V New Carissa have sued the Coast Guard for US$96M, saying navigational charts omitted warnings about unsafe conditions in the waters where the ship went aground and broke apart. 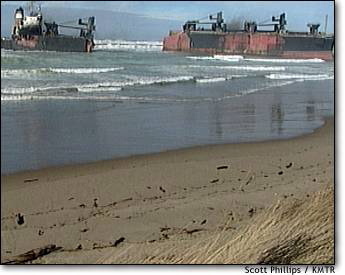 The New Carissa went aground in a storm on Feb. 4, 1999, on the north spit of Coos Bay. About 70,000 gallons of the fuel oil that powered its engines spilled into the ocean. The lawsuit seeks damages for the amount of the cost of the cleanup & salvage operations. The owners claim that charts provided by the Coast Guard and the National Oceanic & Atmospheric Administration didn't warn that the anchorage was unsafe during winter and failed to indicate that dredge spoils from the mouth of Coos Bay had been deposited there, making the water shallower. ***The New Carissa's Owner & Insurer Appeal ......... a US$1.4M federal judgment for an oyster producer whose crops suffered damage after the freighter ran aground in 1999. A federal jury decided in June that fuel oil from New Carissa was responsible for destroying at least 38% of Clausen Oyster's crop. The notice of appeal by Green Atlas Shipping & Taiheiyo Kaiun Co. asks that the 9th Circuit Court of Appeals in San Francisco overturn the monetary judgment & that a motion for a new trial be granted. A U.S. District Court judge denied a similar motion in July. Lilli & Max Clausen, owners of the sole oyster producer that has not settled with the ship's insurers, said they are worried it will be years before they see any payments. Once the cargo holds of the ship filled with the molasse s-like bunker oil, crews set off C-4 plastic explosives igniting hundreds of gallons of flammable napalm gel to make sure the flames didn't go out. "It's going to be like your barbecue pit, if you will," said Coast Guard Chief Gene Maestas. "They are going to put lighter fluid on the coals and light it on fire." The M/V New Carissa, a Japanese-owned freighter, ran aground Feb. 4 about 150 yards offshore with nearly 400,000 gallons of tar-like bunker oil aboard. It began leaking early Monday as pounding waves widened the cracks in its hull. With an approaching storm threatening to tear the ship apart, federal and state authorities decided to burn the vessel and its fuel -- something never before attempted in the Lower 48 states -- rather than risk trying to free the M/V New Carissa. The first attempt to set fire to the ship, using grenades and buckets of gasoline, fizzled with only a flash of flame and a plume of oily black smoke. But the approaching gale slowed, and the revised forecast said a weakened storm would move ashore late Thursday with rain and winds of no more than 45 mph. "Our window of opportunity has widened," Maestas said. Helicopters worked through the day to prepare for the planned afternoon explosions, ferrying in barrels of explosives and lowering them into the ship's cavernous, waterlogged holds. Small Bangalore torpedoes, typically used on battlefields to break up fences, were also brought in to help blow the tanks. "The controlled burn is the highest and best hope," Gov. John Kitzhaber said. "If we don't cause detonation and burn tonight, I guarantee you'll have the release of oil." The structural integrity of the decade-old ship became a pressing issue. Cracks appeared to be expanding along the steel hull. One along its side widened to more than 5 inches, and the jagged split crept up 20 feet from the water line. With every slamming wave, water gushed in and a trickle of black oil oozed out. 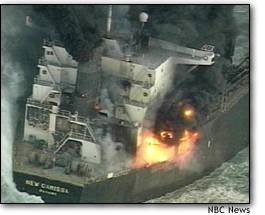 Even though crews got the fire going, M/V New Carissa broke into two sections on 13 Feb. 1999. National Oceanic and Atmospheric Administration (NOAA) experts have said an oil spill could, in a worst-case scenario, coat 50 to 100 miles of the coastline. NOAA scientist Sharon Kristopherson said an environmental disaster could be minimized if the oil spills on a sandy beach, which is the easiest to clean. Winter winds usually blow to the north, which would push the oil in the direction a 70-mile stretch of unbroken beach, the longest in Oregon. If a major spill moves south toward the rocky shores near Cape Arago, it would be much harder to clean up and invade the habitat of sea anemone, starfish algae, and threatened Stellar sea lions. About 350 workers have been mobilized to scrape up the oil already ashore and watch for affected wildlife. Five dead birds have been found, three soiled birds were captured, and some threatened Western Snowy Plovers were seen with spots of oil. Demolition experts attempted to torch the remaining fuel from a heavily listing wreck on 14 Feb. estimating that 90% of the oil has been burned off the grounded freighter. A helicopter dropped a fire accelerant on the ship 14 Feb. afternoon to reignite one of the cargo holds of the New Carissa, which may have as much as 50,000 gallons of fuel oil remaining. The practice was repeated several times throughout the afternoon, since the fire kept going out. Tar balls have been spotted along the shore and 37 dead birds have been found. The tar balls were ``very few and far between,'' said Petty Officer J. Bigelow, a Coast Guard spokesman. Environmentalists are hoping that will be as bad as it gets, but they are still watching and waiting. COOS BAY, Oregon (AP) -- M/V New Carissa, or what's left of her is not going quietly. The oil-laden bow section of the once-beached freighter was drifting back toward the Oregon coast early on 3 March after a storm ripped it free from the tug towing it out to sea for burial. Bad weather & 90 mile per hour winds snapped the heavy cable between the salvage tug and the bow section. "Certainly the worst-case scenario is that she would come up on shore again," said Coast Guard Capt. Mike Hall, who just hours earlier had celebrated the departure of the wreckage. Indeed, his worst-case senario came true. The tug Sea Victory had made it 50 miles to sea when the massive tow line, 10 inches in diameter, broke in Tuesday evening's storm. Pushed by 60- to 90-mph winds and 30-foot swells, the 420-foot bow drifted to the northeast and was within 30 miles of Florence by midnight. By early 3 Mar '99 the bow section again grounded hard near Newport, about 100 miles southwest of Portland. Cleanup crews there were preparing for a grounding that could spill the 130,000 gallons of thick, gooey fuel oil still onboard the broken bow. Officials had feared that the storm might sink the bow, but they felt it would not matter so long as it was at least 50 miles offshore and beyond the edge of the environmentally sensitive continental shelf. The 640-foot New Carissa ran aground Feb. 4 while waiting for a load of wood chips outside Coos Bay. Stuck in the pounding surf, it eventually started leaking some of its 400,000 gallons of heavy fuel oil. Attempts to burn off the oil were partially successful, but the ship cracked in half, spilling 70,000 gallons. State biologists have found more than 100 dead birds in the area; at least 48 died from exposure to oil. The next plan to save the beaches involved towing the bow out to sea. It moved at a glacial pace when pulling began Friday, but it eventually bulled its way through two sandbars before breaking into the open sea Monday night. Bill Milwee, the salvage consultant to the ship's Japanese owners, said US$10M has been spent to date on the operation, with much more to come. The cost is being born by the ship's insurer. From The Cargo Letter - LAX -- The bow of M/V New Carissa now at sea under the tow of tug Sea Victory, the choices are three. Either sink the hulk by Naval gunfire, on board explosives, or a U.S. Navy air strike. Looks like a fun training exercise at hand. Stay tuned. UPDATE 11 MARCH 1999 - The End? WALDPORT, Ore. (Associated Press with The Cargo Letter) -- Three hundred miles offshore, the wreck of M/V New Carissa finally sank on 11 March 1999 after a Navy destroyer fired 70 shells into the oil-laden hulk and a submarine drilled it with a torpedo. First, remote-controlled explosive charges blew holes in the hull of the wreck that has plagued the Oregon coast for more than a month, fouling miles of beaches. When that failed to sink the ship, the destroyer U.S.S. David R. Ray opened up a barrage of artillery fire from its 5-inch-54 guns, and then the nuclear sub U.S.S. Bremerton fired a torpedo shot into the hulk. Salvage experts said sinking the ship 300 miles out in the Pacific was the only way to finish off a wayward wreck that has fouled two Oregon beaches and was still believed to hold 130,000 gallons of fuel oil. At depths of 12,000 feet, where temperatures never rise above 34 degrees, experts say the sticky bunker fuel will be trapped in a semisolid state. The saga of M/V New Carissa began Feb. 4, when the 639-foot freighter with 400,000 gallons of fuel oil on board ran aground off Coos Bay. About half of that was burned off by explosives experts. Hours after the Feb. 10 fire, the ship split in two, spilling 70,000 gallons. Efforts to tow the bow out to sea failed when it broke away and washed ashore 80 miles north at this tiny town along the Central Oregon Coast. Back on the beach, more than 604 dead birds have been found on both nearby shorelines since the grounding, 273 of them with splotches of oil. Globs of oil -- about the size of pencil erasers -- continue to wash ashore. Meantime, the 220-foot stern section still sits, half-buried, in the beach at Coos Bay. In Washington, the House Transportation and Infrastructure Committee approved legislation that would give the Coast Guard new tools to regulate foreign-flagged vessels like the New Carissa in U.S. waters. The proposal by Rep. Peter DeFazio, D-Ore., would require foreign ships to give notice 24 hours before entering U.S. waters, give the Coast Guard authority to deny a vessel entry into U.S. waters based on safety concerns and make it clear that the Coast Guard has authority to direct the movements of foreign vessels during hazardous conditions. UPDATE 10 Fbebruary 2001 -- Here Come The Lawyers! From The Cargo Letter, Aug. 2006 -- Will M/V New Carissa Find Rest? For 7 years, M/V New Carissa has refused to move from its spot off the Oregon Coast. A broken section of the wood chip freighter weighs 1,500 tons and is dug 40 feet deep into the sands of the North Spit. Salvage experts have set it on fire, yanked it in half and eventually walked away, wondering aloud if it shouldn't just be left where it sits, 150 yards from the beach. Now the State of Oregon is ready to try again. It is negotiating with Titan Maritime Co., a Florida-based company that owns giant jack-up barges. The barges would be planted firmly in the sand, holding hydraulic pullers that would attempt to roll the ship out of the sand and slice it apart, piece by corroded piece. If the company succeeds, the remnant of a ship, which has killed thousands of shorebirds and contaminated oyster beds after spilling 107,000 gallons of fuel, will live on only in memories. State officials have enough faith in the company that they've chosen to skip a public bid and negotiate directly with Titan, a subsidiary of the Crowley Maritime Corp. The state reasons that Titan owns the only jack-up barges capable of the mammoth job. Dept. of State Lands attorneys are already working out the details of the contract. Oregon has US$22.1M to spend from a settlement with M/V New Carissa 's owner, Green Atlas Co. About US$18M will pay for the ship's removal, while the rest will go to legal fees. There are two roughly outlined plans. The first is the "grab, pull and cut" method. Titan brings in 2 jack-up barges with 6 legs apiece. The legs will be driven into the sand in the surf line, and then hydraulics will jack work platforms out of reach of the breakers. The company will place 320-ton hydraulic pullers on the work platforms and attach them to the hull of M/V New Carissa with the aim of breaking the suction that keeps the ship trapped in the sand. As the pullers roll the ship out of the sand, crews will cut it apart. The idea is that the job will get easier as more metal is cut because the ship will be lighter. No one knows how strongly the stern is attached to the hull of M/V New Carissa. Given that it snapped in half when salvage teams tried pulling it from the sand shortly after the wreck, there's no guarantee it can be yanked out now without breaking again. If it breaks, Titan moves to its backup plan: to cut the ship off at the sand line. But then there are the other pieces of the ship, including a crane that was once attached to themain hull that collapsed into the water and is now as deep as 20 to 30 feet in the sand. If the contract is signed next month, work could begin as early as next summer, with the ship gone by fall.